Many wild bird species will flock to a suet bird feeder filled with this nutrient-rich food -- especially if the cakes of animal fat include treats like peanuts, dried fruit or sunflower seeds. 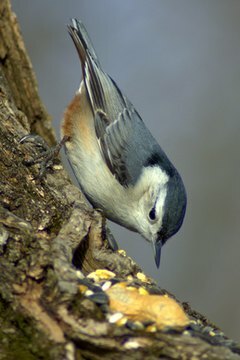 Woodpeckers, wrens, chickadees, nuthatches, kinglets and cardinals will all visit a well-stocked suet bird feeder set up in a wooded backyard or meadow. Unfortunately, determined feeder pests -- starlings and squirrels -- will also try to get at the food and push away smaller birds. The best defense against invasive pests is a squirrel-proof suet bird feeder with the suet accessible only from the bottom, requiring birds to perch upside-down to eat. Chickadees, nuthatches and woodpeckers will have no problem doing so, but starlings and squirrels won't be able to reach the food. This feeder's ingenious design not only serves up food from the bottom, but also features an unattached roof that lifts along a nylon cord tied to an anchoring dowel. Because the roof is not nailed to the sides of the house, filling the feeder by simply lifting the roof is a snap. Drill a 7/8-inch diameter hole 3/8 inch deep in the center of each side piece. Note that the holes will not be through the wood; their purpose it to hold the ends of the dowel inside the feeder. Set the two end pieces aside. Connect the roof pieces: lay the wide roof piece on a work surface, then hot glue the 10-inch edge of the narrow roof piece perpendicularly to the 10-inch edge of the wide roof piece. Nail into place. Turn over so the roof has a peak. Drill a 7/16-inch hole through the peak of the roof, equidistant between the two ends. This hole will allow you to hang the feeder with the nylon cord. Bend the piece of hardware cloth in half at a 90-degree angle so the 11-inch edge becomes two 5.5-inch lengths at a right angle. Staple the wood end pieces, dowel-hole on the inside, to either end of the bent hardware cloth to form the sides of the suet bird feeder. Wedge the dowel into the two dowel-holes and hot-glue to secure them. You will now have the bottom of the feeder assembled. Tie one end of the nylon cord around the dowel securely, then thread the other end of the cord through the 7/16-inch hole in the roof. Do not nail the roof to the sides or you won't be able to fill the feeder. When hanging, the peaked roof will lay flush against the tops of the feeder's sides; simply raise the roof on the nylon cord to add suet to the feeder. To make sure squirrels can't shimmy down the nylon cord or leap from a tree branch onto the suet bird feeder, hang the feeder from an isolated tree limb in an open space or purchase a metal feeder stand with arms from which to hang the feeder. What Kind of Food Do Squirrels Eat?